Currently loves: tasting everything she can get her hands on, long sprawling naps, her yoga routine (favorites: downward facing dog, locust pose, and bridge pose:)) the kiddie pool, mashed potatoes, and playing the piano with daddy. Known for: her epic pouty lip, backwards crawling, her big appetite, never keeping her socks or headbands on, being doted on by her big sisters, and her hugely contagious giggling. 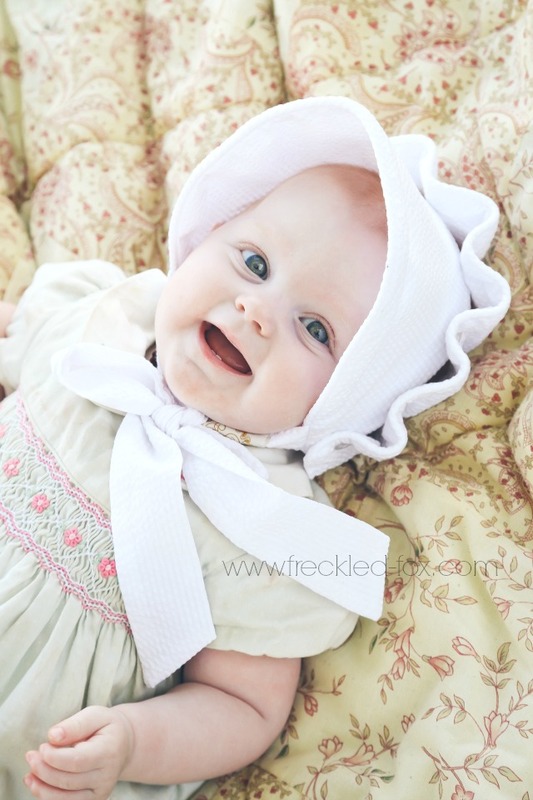 Outfit Details: Big shoutout to the Beaufort Bonnet Company for this amazing bonnet they sent for Lydia. I can't get enough of her in it! The people there are so sweet and the shipping was fast. I was also surprised that it fit so well even with the bigger heads our kiddies have, and it keeps the sun out of her eyes amazingly well while looking just too adorable for words:) The dress was actually a gift (bought at Macy's) for Eleanor before she was born and has been worn now by all our girls, the baltic amber necklace was a gift as well and has been on her neck for months, the shoes were also a hand-me-down from her sisters, from TJ-Maxx. 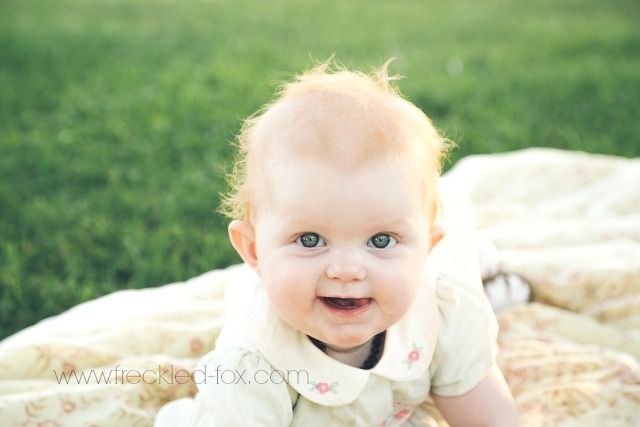 You are such a joy Lydia! You have such a sweet little soul and our family is so lucky to have you in it. I can't wait to see what you'll learn and experience next, and never forget how much we all love you. Thank you guys for visiting today, and I hope you have a great rest of your day! 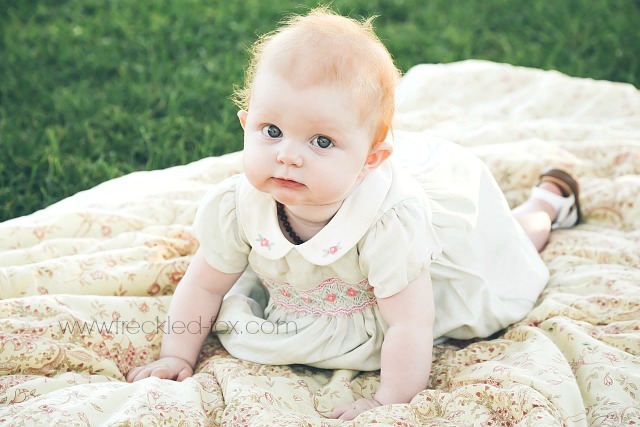 Oh my gosh Emily, she looks like a little doll! 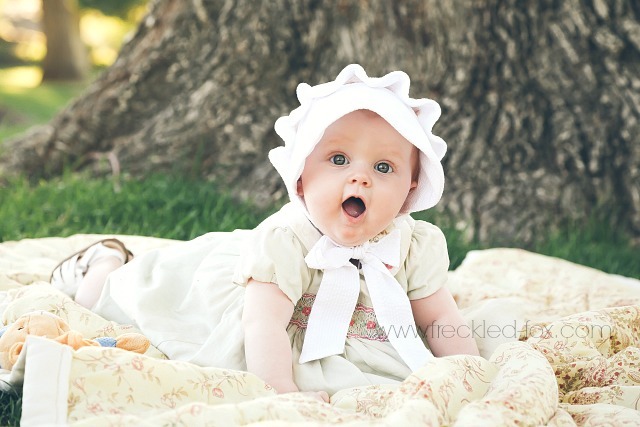 I love baby girls in vintage looking clothes, I loved dressing mine that way as well. Just gorgeous! 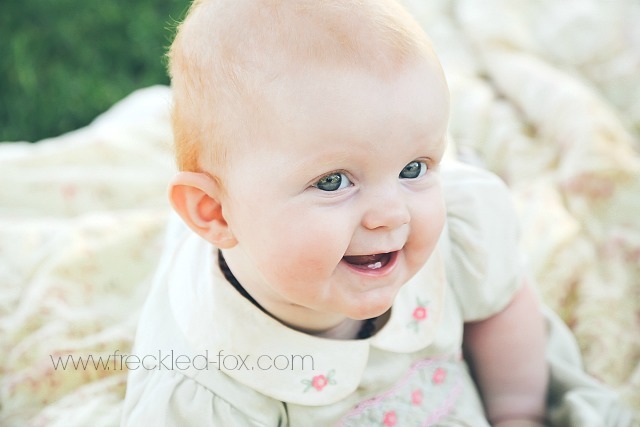 I can't believe she's 8 months already! Time flies! And you may be biased but she is also just flat out adorable! 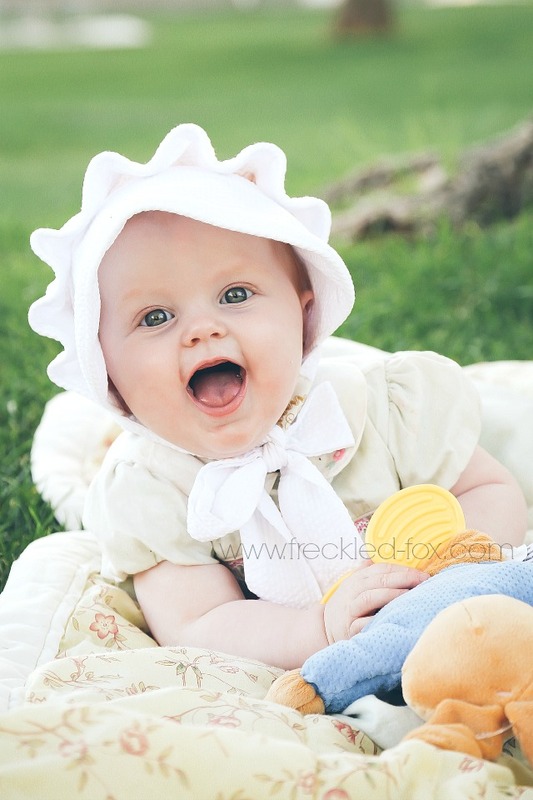 She is so adorable in that bonnet! 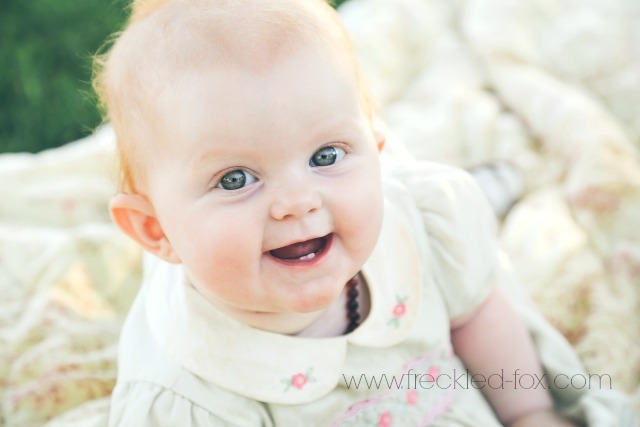 She is adorable, as are all of your kids! such a precious little babe! She is so so beautiful! You have by far one of my favourite blogs out there. These pictures are simply precious, thank you for being willing to share all of this with us, and for the constant inspiration. She's getting SO big! I feel like she was just born! Aw she's so cute--looks just like you! She is just precious Emily! And she's growing up so fast! 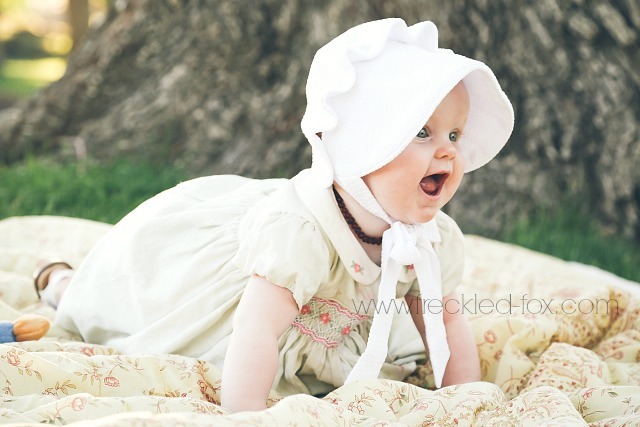 She seriously looks like a doll in that bonnet - I love it!